Thanks Val for the wonderful Vintage weeks, I greatly enjoyed your challenges. 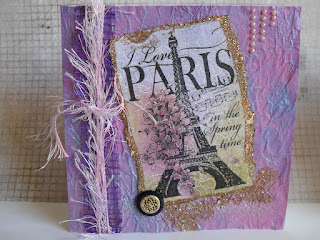 At Make My Monday during October it is Fliss's choice of a French theme, this being the first week it is PARIS. Oh la la. For my project I first took a sheet of previously prepared copy paper, which I created using Starburst Stains from the Stampman, I then added the stamped image of Paris from Stampendous. I added the colour with chalks, added Frantage mix around the edges and at the base. 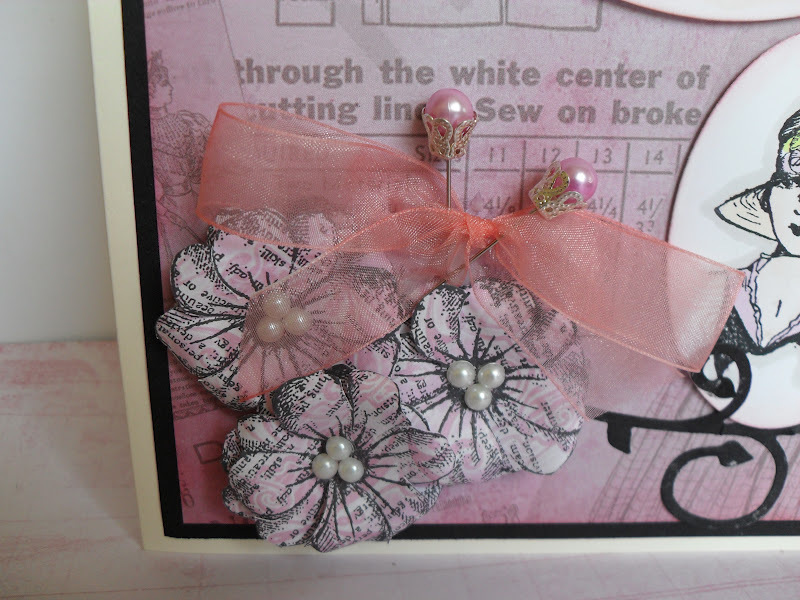 I added a button and pink pearls to embellish. All tied together with some purple mesh and fancy fibres. I would like to thank Jill from The Stampman who demonstrated the use of the Frantage at a workshop, I learnt so much from her on that day. Now I am wanting to see your creations of Paris ladies. Please pop over to MMM to see the wonderful projects from the DT. This week at CD Sunday Challenges we are challenging you to provide us with Tea Time. 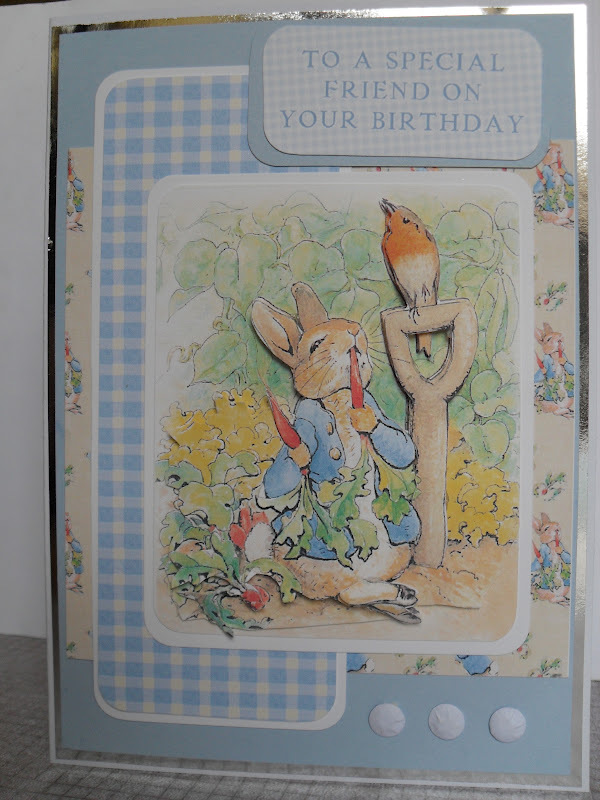 I decided to jump out of the box and instead of super tables set with beautiful teas, I found Peter from Crafty Companions's The Tales of Peter Rabbit, munching away on carrot's in a garden. I caught Peter at tea time having his mid afternoon meal, he and the surrounding area have been decoupaged. Last week you all excelled with your flowers, so this week should be great fun visiting you at TEA TIME. Have fun, but please remember there must be something on your project from a CD. 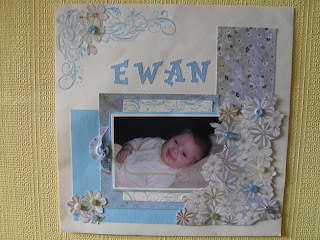 Use It Tuesday are challenging us this week to Use Scraps - this fitted in so well with an idea I had to use up some small squares I had left over from another project using TH Shabby Chic paper. 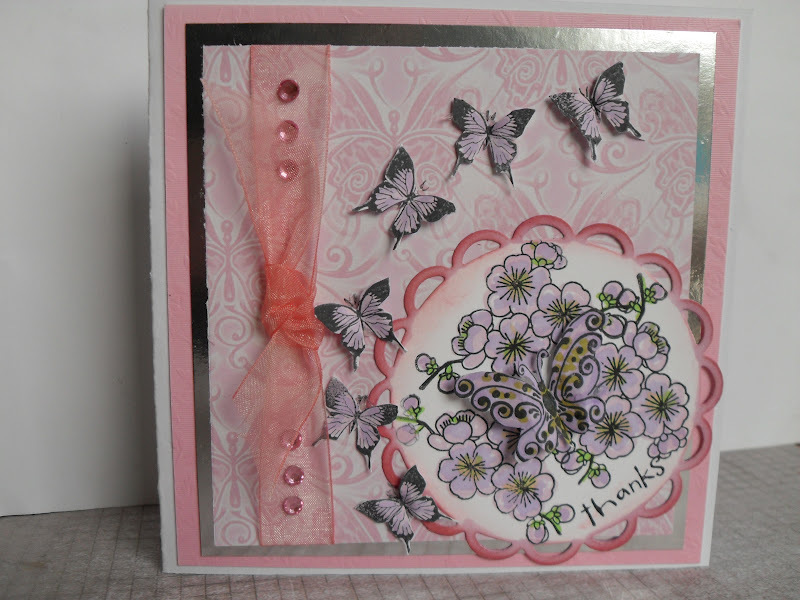 The Butterflies and upper sentiment are stamped using Lyndsay Mason Tattered Butterflies set. The flowers and swirls are made using Marianne dies. 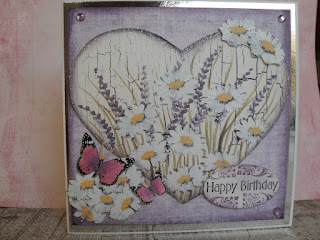 I am so thrilled to have won the August challenge of Flowers at Addicted to Stamps, thanks to the design team. 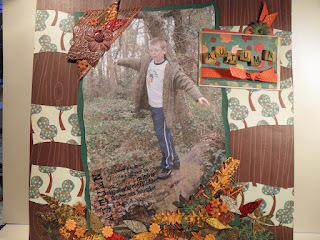 This is my entry for the September challenge which is AUTUMN. The last two days here in UK it has rained and been cold enough for winter, never mind autumn. I feel we missed having summer, I'm sure hoping we aren't going to miss Autumn too. Back to my LO page, please say Hello to Jordan, my second oldest grandson, though I admit this was taken some years ago when he was much younger for he will shortly be 17. The pocket at the top right holds a tag with the journalling of who, where, what, when and why, which I think are essential on a scrapbook LO. The leaves have been mostly stamped onto handmade(bought) papers, to give a mixture of textures and colours, with a few fancy buttons scattered around. 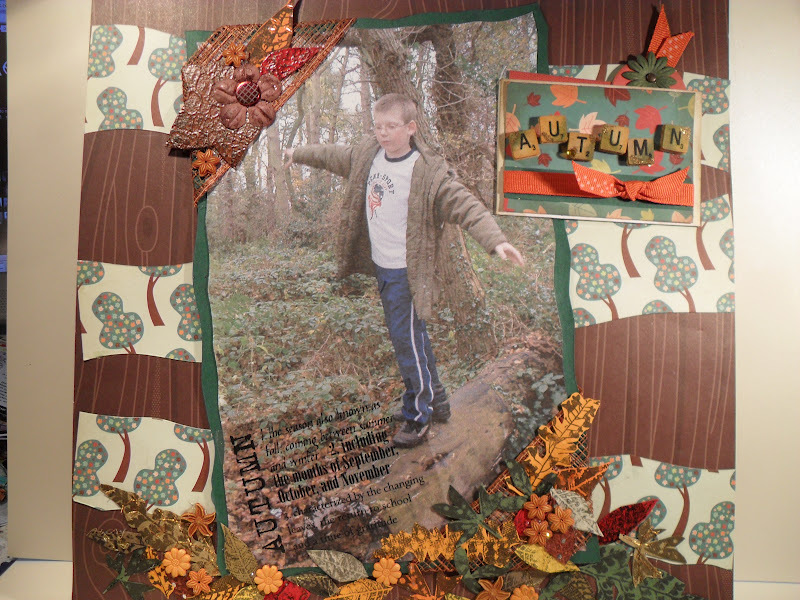 The Definition of Autumn - on the tree trunk is from DCWV (Die Cuts With a View). Addicted to Stamps are currently hosting their Bingo challenge I'm cutting it fine, but firstly hummed and hawed about which line to take. Please pop over for they are having a DT call too.I eventually decided upon the diagonal line from top left to bottom right. 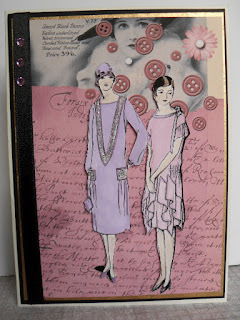 SCORE - FREE - I chose EMBELLISHMENTS and PURPLE. I made a stepper card, the papers are from a Daydreamer pad. The fairy and sentiment are from LOTV., all were coloured with Promarkers. 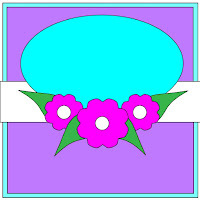 The flowers were cut out with a Marianne die . I do hope you like it for I know I am always saying I don't do cute, but lately these LOTV stamps have inspired the cute creativity within me. Hello everyone, on this wet, cold September Morning. This week sees our last visit on Make My Monday to Val's monthly choices of Vintage and we want to see any form of travel in days gone by. 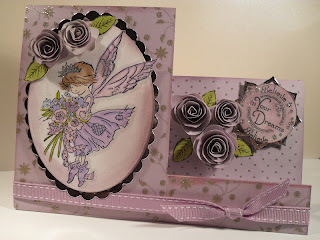 Please pop over to our main blog where the team and our guest designer Alyson have created some wonderful cards for your inspiration, this is my card. 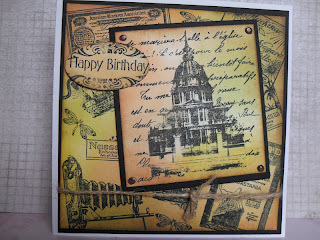 The background paper is from http://freevintagedigistamps.blogspot.ca/ I then stamped a few hot air balloons. The 3 Wise Gentlemen are from Crafty Individuals, coloured with DIs. I don't know what the technique is usually called of the train, (an old stamp, not sure of the make) but I call it a Split Negative. I created the smoke by adding white, gold and touches of black Frantage for the smoke. I look forward to visiting your Vintage Travel creations. Have fun, I sure did. 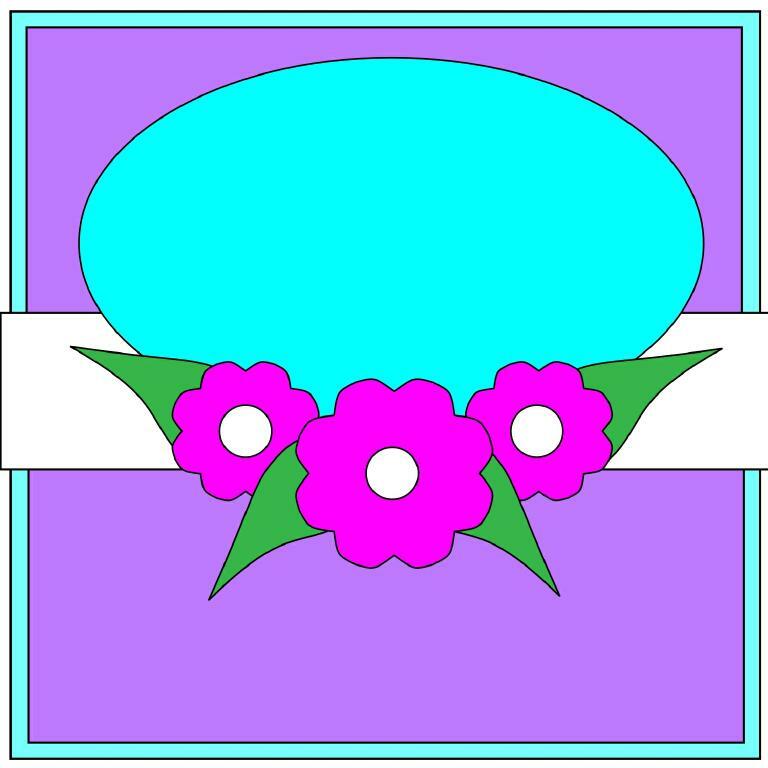 This week at CD Sunday Challenges we want to be Awash with Flowers - Carol has chosen this flowery topic, which I know everyone will love playing with. I certainly did. 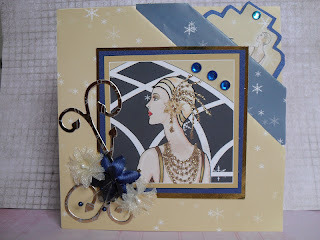 My card, is constructed from the designs on Sheena Douglas paint Fusion CD . The butterflies are from a Debbie Moore CD. Again I so much look forward to visiting your creations. At Alphabet Challenge this week it is Mari's turn, and for the letter Q she has chosen Fit for a Queen. So a great excuse to get out the jewels and gold. A challenge is a challenge, I didn't have anything Queen like at the time, since then of course I've found so many suitable alternatives. However, I thought Queens don't always wear crowns and diamonds, so here is my Queen with her lady in waiting, preparing to go out on a visit. The background is from the Debbie Moore Haberdashery CD. The digi stamp of the ladies are from a free site on the web for vintage downloads, sorry I have forgotten which one. I have 3 on my side bar for you to take a peek if your interested. I had great fun looking at the pocket cards, there were some real stunning entries. 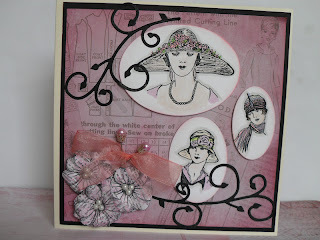 I am again looking forward to popping onto your blogs to see your new regal creations. On my Scheduling Calender and Clock the time zone is Pacific Daylight Time. I live in UK. How can I change the time zone to British Summer Time. Any computer techo whiz out there your help will be so gratefully accepted. Lily Of The Valley Thursday challenges are this week looking for Flower Power - I'm probably a little under full power but I felt there were plenty of flowers on the card so as not to distract from the beautiful main image of the baby ready to be Christened which is a LOTV stamp. I made the flowers with pretty pale pink vellum. The method I used is on my Tutorial blog, the size of the rose depends upon the size of your circle and how tight or loose you wish the flower to be.I hope you like it ladies. Thanks to all for your comments. This week at Sunday Sketch and Stamp it is #124. How did it take me this long to find them? The BP is from Funkyhand Happy Birthday CD. The fairy image is a LOTV stamp. The flowers are a Dreamees stamp. Do pop over there are some wonderful design team cards to inspire you. coloured with Promarkers. 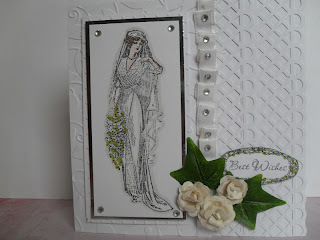 We had some stunning Vintage Wedding cards for last week's challenge at Make My Monday, I felt I wanted to go to a wedding. LOL. 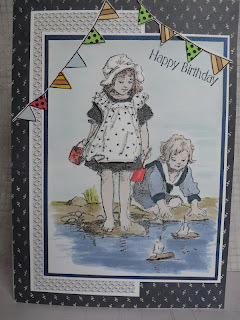 This week Val has chosen Vintage Childhood for us for the challenge. I look forward once again to visiting to see your interpretation of the theme. Here is my card. Firstly I would like to thank Val who directed me towards a Free digital downloads blog - check on my blog on the right side, the one with the hand pointing. This is where I found this wonderful image. I decided to use a selection of Distress Inks TH which I used as watercolour paints. The hair and skin were coloured with Promarkers. The backing papers were from my stash and the bunting is from a Funkyhand CD. Have fun everyone, I'll be popping round to see you all very soon. Many thanks for the comments which I always greatly appreciate. CD Sunday Challenge, which this week is Feline Friends. 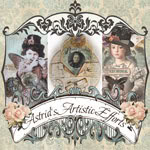 I was lucky that several years ago I bought over a period of time a number of CD's from E bay for only 99 p each- Maria G Designs. They are simply images but I found them them very useful for some of the challenges, this being one of them. Aren't these just the cutest kittens? then cut the A4 in half to have two halves, score 1" in from the left on the top sheet and secure the 1 inch with strong tape or wet glue. The paper is from Paintbox Poppets from Crafter's Companion. The flowers are stamped with a Dreamees stamp, the butterfly is from a free stamp from Craft Stamper. I am really looking forward to visiting all of your Feline Friends over the next week. I hope you have lots of fun and hopefully a healthy week ahead for us all. 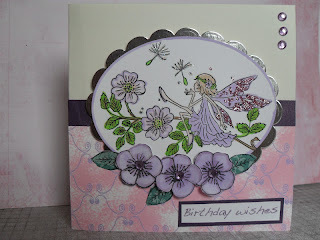 At Addicted to Stamps monthly Scrapbook Challenge #3 is 'Flowers'. Here is a LO I made of my youngest grandson. There are several layers of papers, all of the flowers were cut from a full size scrapbook page. I added buttons to match the colours on the page. At the left of his picture there is a hidden tag, you hold the button and pull, it has all the details of his birth. Of course there had to be some stamping so I have used a blue ink pad and stamped with a favourite La Blanche scroll stamp. 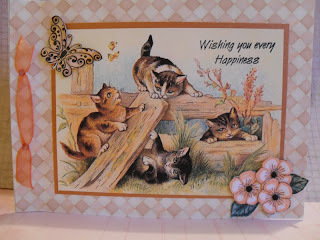 I am also sending this to Happy Scrappers - for their Buttons and Bows challenge. I have lots of buttons, but only one knot, bows don't look right for a boy. Hoping it is acceptable. Keep the UK flag flying girls. 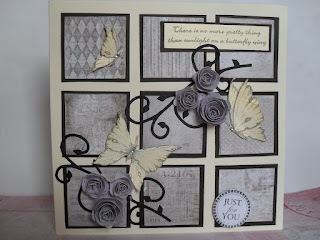 Addicted to Stamps 'Make Your Mark' challenge #3 this week asks us to create a project where we have used our markers. Any colouring markers are accepted. I had so much fun making this card, I have made another 5 to add to my Christmas cards. The papers are from LOTV - Frosty Christmas, the stamp is also from LOTV. The sentiment is from a Flowersoft stamp. As all my followers know, I don't normally do cute, but sometimes they are just irresistible. I used Promarkers to colour the image. 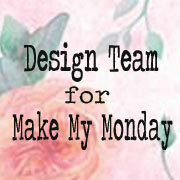 On Make My Monday challenge blog Jacqueline, our fearless leader has asked the Design Team to join her in producing the regular Mid Week Motivations. This week is my turn. I do enjoy making Wedding Cards, especially of the Vintage style, plus appropriately it was my Wedding Anniversary on the 10th. 46 years, gosh! how did that happen so quickly? 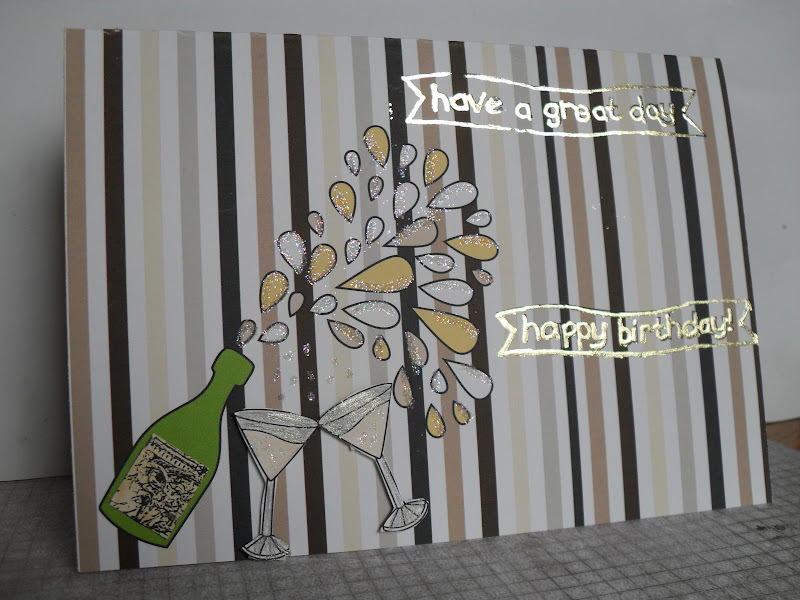 The card consists of two strips of punched card made with a Martha Stewart punch. 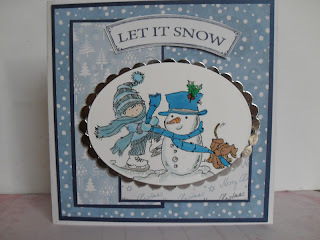 Again I have used the Christmas Vine Embossing folder for the background. The bride, a Bravura Stamp, was stamped with Memento and coloured with Promarkers. I am not a Promarker expert but for anyone who is even more a novice than myself , here is my guide. 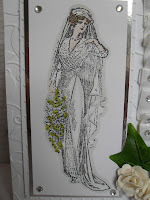 Dress and Veil - Lace A White Pencil, Outline and Shading - Cool Grey 1. 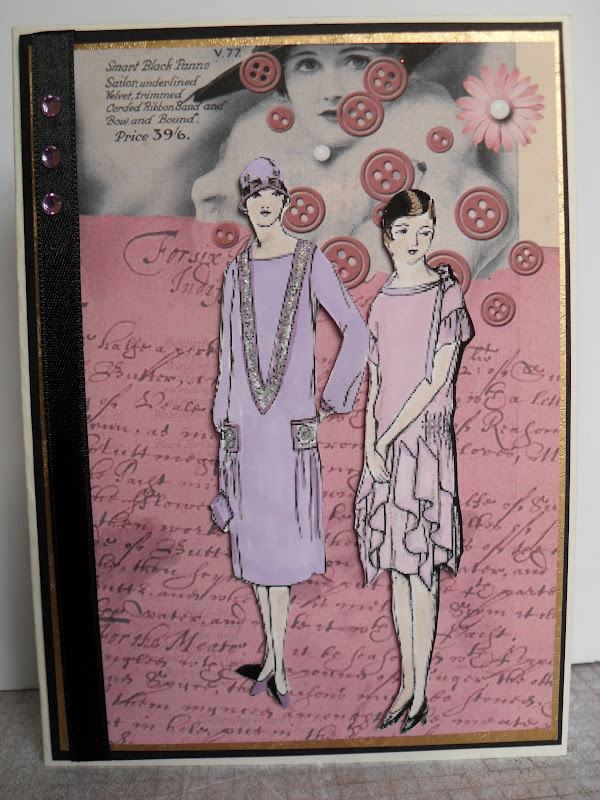 We had some really beautiful Vintage Fashion projects on our return last week from our summer break. 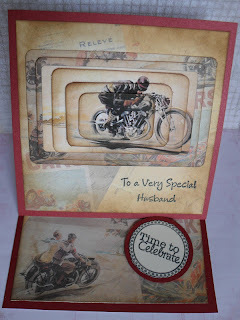 It is now time at Make My Monday to make a Vintage Wedding card or other project, as long as you adhere to the theme. 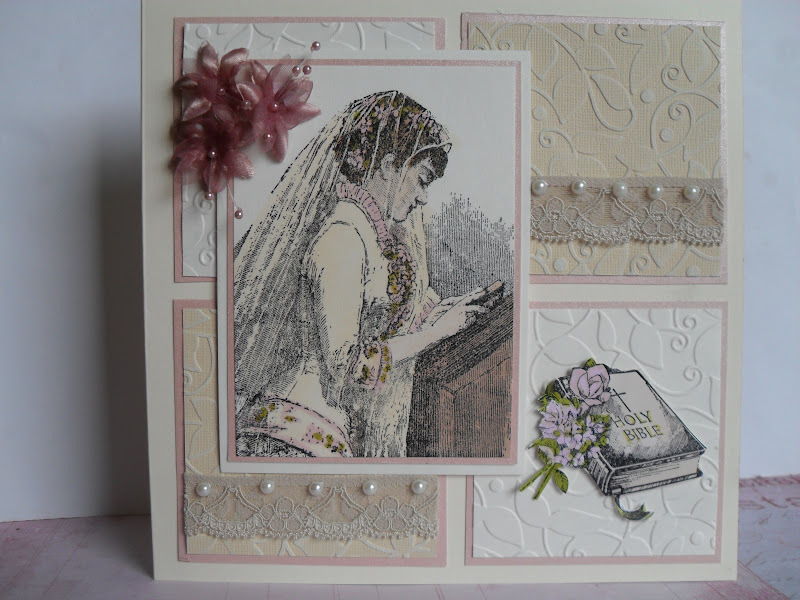 Modern wedding cards can be very nice, but I really like the way our ancestors in past years seemed to create such beautiful cards. Remember Vintage does not mean Victorian, it can be any past age. Coincidentally, it is 46 years today since my husband and I were married, now that's what I call vintage. I have made an 8" sq card. I used a ivory, pink and beige card throughout, for white weddings were not the fashion of this era. I used my favourite embossing folder Christmas Vines which looks good for any card, not just Christmas, A little beige lace, pearls and flowers to embellish. A beautiful small stamp of a bible with pretty flowers, source unknown, purchased from E-bay. The main image is from a La Blanche stamp. I used Promarkers to colour the image. I have left space on the top right panel, to add a personalised sentiment at a later date. This week at CD Sunday Challenges it was my turn to choose the topic of the week, which is Need for Speed. For me it had to be a motorbike, for my husband and I spent most of our courting and first year of marriage riding on his Norton motorbike. 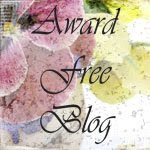 Please pop over to the main blog for the DT team and our guest Kevin have really enjoyed thinking of and creating so many ways we think of a Need for Speed. 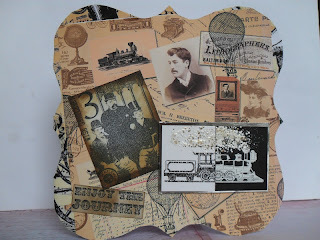 I made an easel card using papers and images from a Debbie Moore Shabby Chic - Vintage Travel CD. The stopper Time to Celebrate was a freebie stamp from the Craft Stamper magazine. I look forward to seeing your cards showing your interpretation of the theme. Remember you must use something from a CD. Over at Alphabet Challenge we are already up to the letter P which we would like to see a POCKET on a card, having something in the pocket would be nice too. If you care to look on You tube there are many variations of pocket cards, all fairly easy to follow. Remember it is a challenge, so meet the challenge head on girls, I am so looking forward to seeing your projects which don't have to be a card. The DT have made some excellent examples of cards with pockets, please do pop over to have a look. Here is mine, a sample of which the class I run all did this, this morning and had a great time. This is a double pocket card, for which I thank Franki at Franki's Crafty Touch in Darlington for the instruction, this is also were I purchased the main papers from. Happy crafting all. Welcome to my recent new followers, such a delight to say hello to Lyndsey, Karen and Kevin. I hope I can continue to provide interest on my forum. 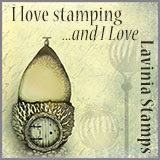 Looking around for a different challenge blog I found Addicted to Stamps, which describes me perfectly. this week for their challenge it is Sketch #2. Here is my interpretation. 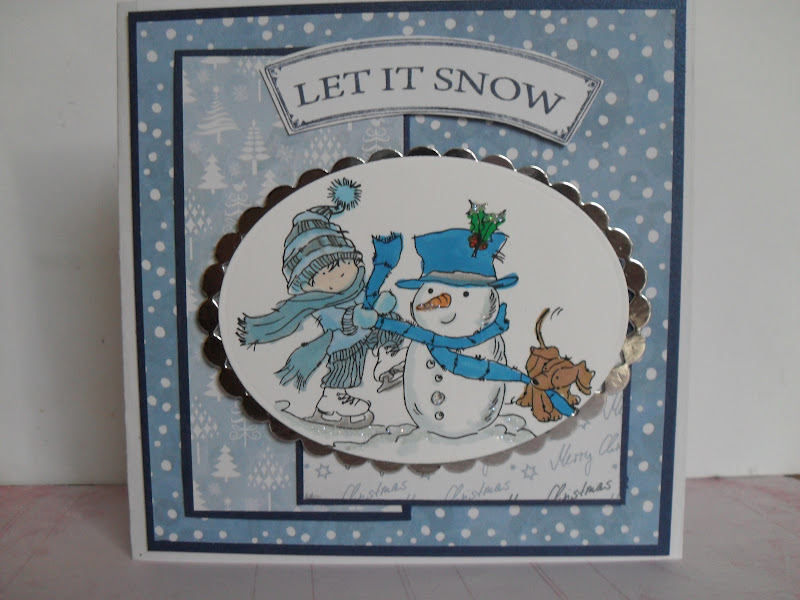 The background and centre panel have been embossed with a Christmas Vine embossing folder. 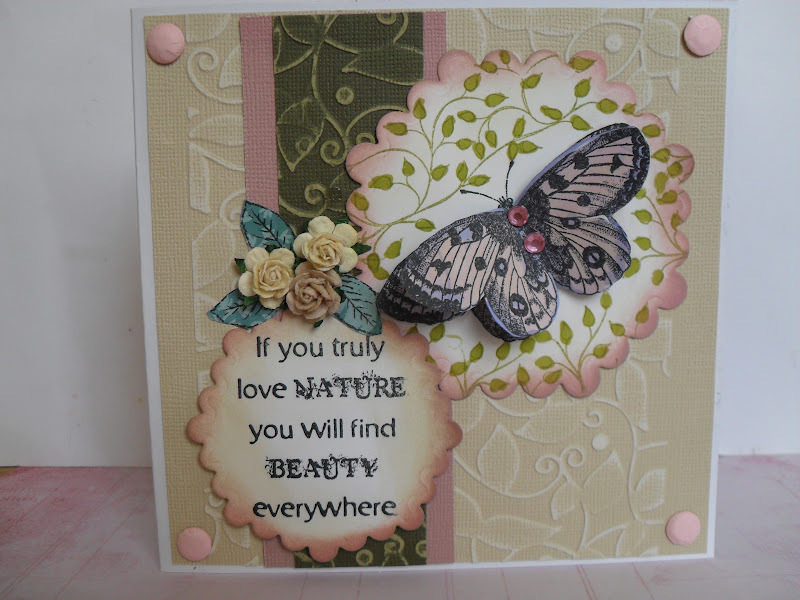 I used leaves from a Paperartsy set to form the background for the butterfly. the butterfly and sentiment are from Indigo Blu stamps. 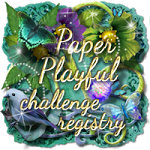 I wish this relatively new challenge blog lots of best wishes and shall be following their challenges and hopefully joining in a few as the weeks progress. 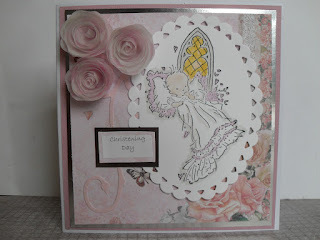 I am also entering this card into Crafty Cardmakers for their challenge Winged Things. It's been many a month since I joined in the St. Luke's Charity Card Challenge , I guess it's about time I put that right. Their current challenge is COUPLES, it needn't be of the human kind, if you look at their site they have shown many varied examples. I have stuck to my original thought, of a human couple, simply because I had a stamp in mind I wanted to use. I recently purchased a pack of Papermania Capsule Collection papers, I'm not sure what these are called but it is all creams, beige and light browns, so suitable for vintage cards. 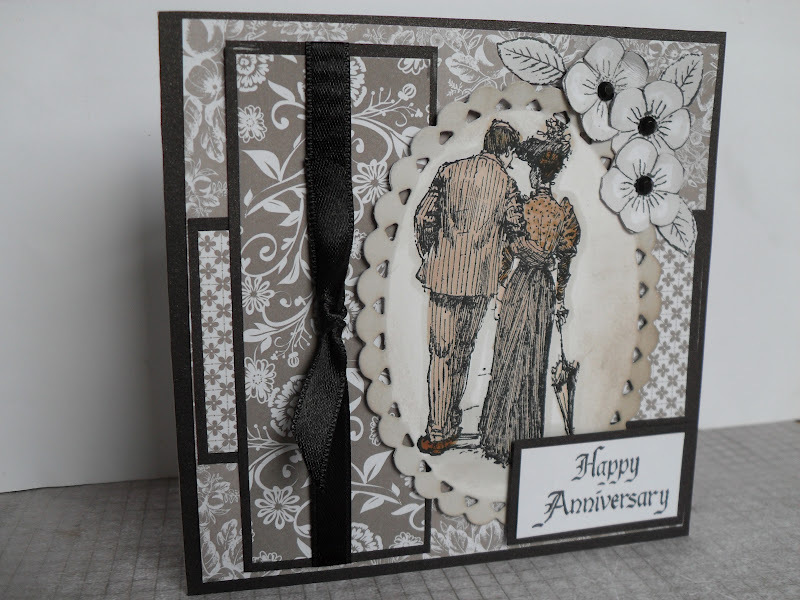 Couples stamp Wooden Inkadinkado, small flowers - Dreamees stamps - Happy Anniversary - stash. Coloured with Promarkers. 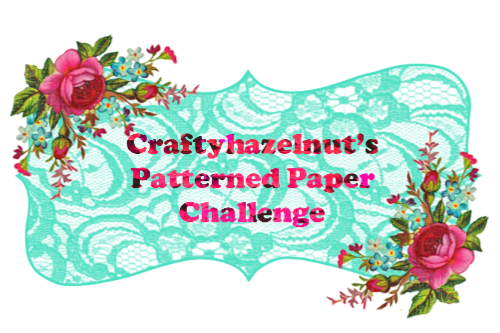 Two newly discovered blogs caught my attention recently so I have combined their challenges. Not something I normally do but I am looking to challenge myself more, I feel I have recently become comfortably sat in my comfort zone. Sunday Stamp and Sketch - have produced a relatively simple sketch but aren't they fun to play with? I think the smaller butterflies and the flowers are from a Kanban set of stamps. 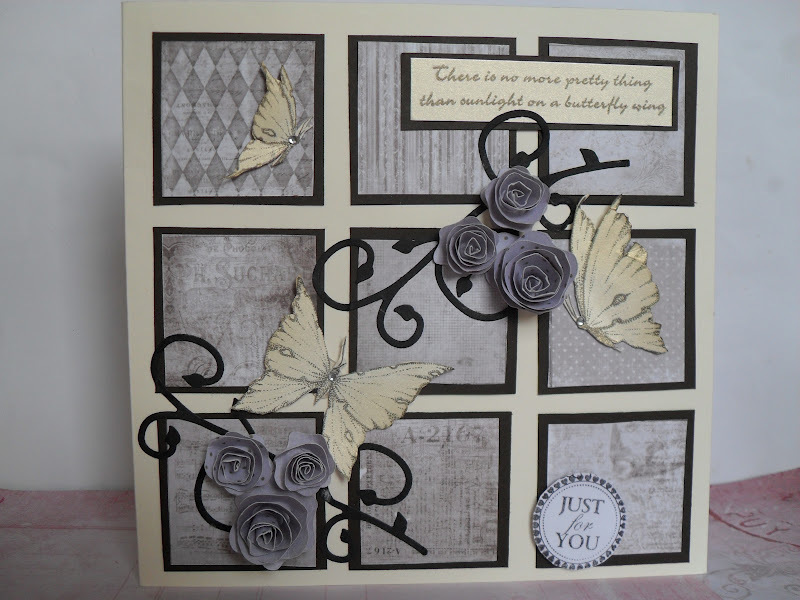 The larger butterfly in the centre of the circle is another marvellous freebie from the Craft Stamper magazine. Pink being the chosen colour for the In the Pink challenge. This is the second week for the theme of Travel at Try It On Tuesdays, this is a card I made for a recent class, which fits the theme very well. 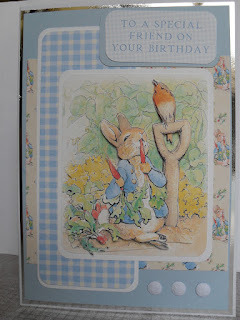 I used for the main image a stamp from Indigo Blu. The remaining stamps are from a mixture of sources, including Tandastamps for most of the travel ones. 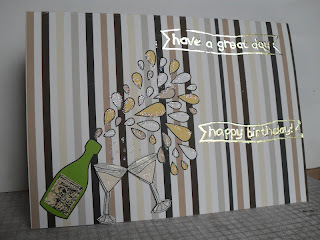 I created the background with several Distress Inks TH. Check out the faux brads - circles made with a Promarker, covered with a drop of Glossy Accents, an old trick but it may be a new tip for some. I think this will be a popular month, so come on ladies get out your stash and have a play. We have a new Guest Designer for the month, a welcome to Alison, I look forward to seeing her contributions during the month. Please pop over to the main blog to check out what the DT have created for the topic. Here is mine. 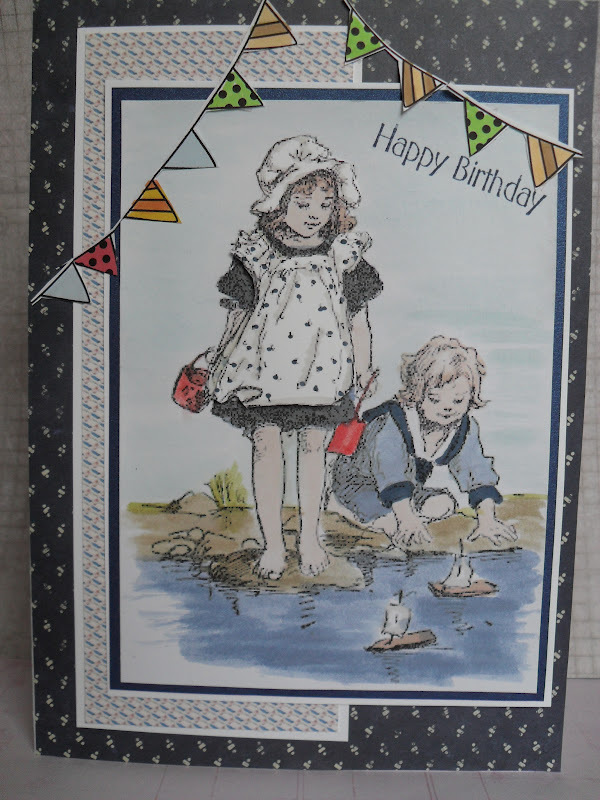 The background page is from a lovely vintage pad from Craftyworks. 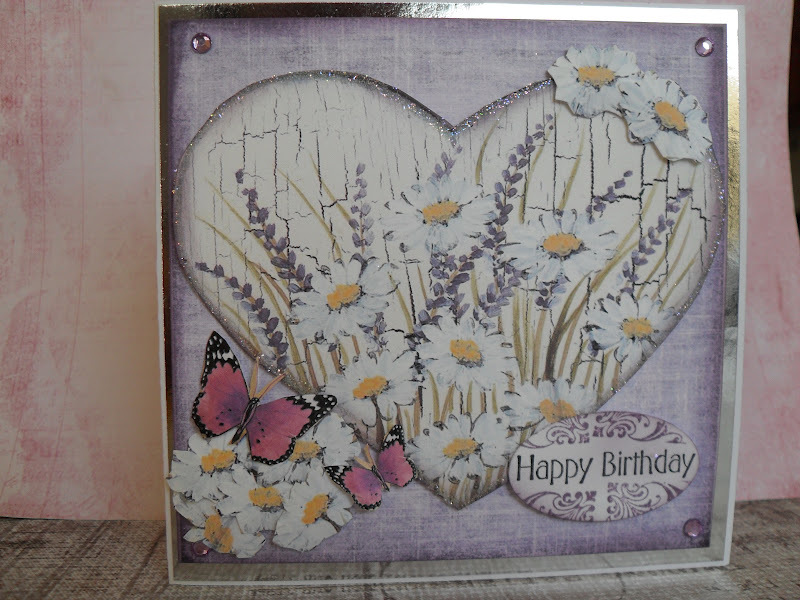 The larger image is a newly purchased stamp from a bargain box from Dimension Stamps. The two smaller images are from personal Impressions wooden stamps I've had for years. I die cut all three with some new oval dies. 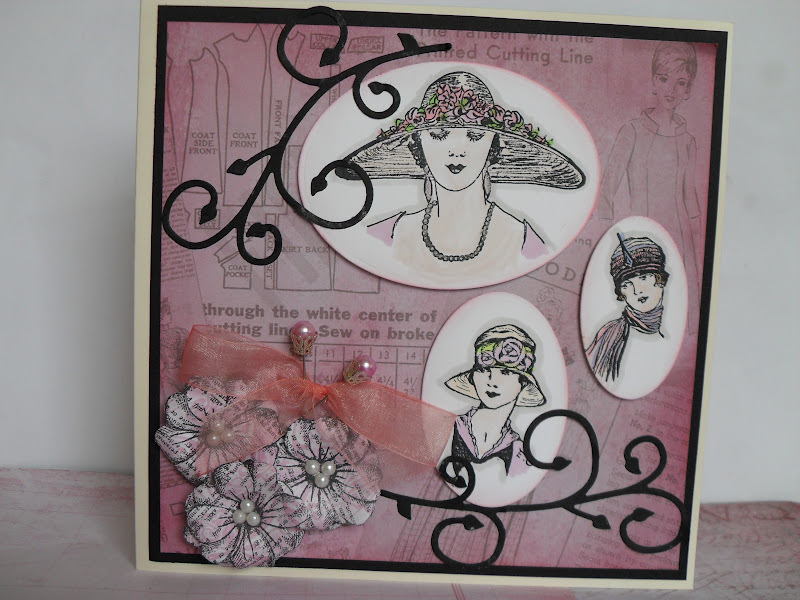 The flowers were stamped from one of my favourite freebie stamps from the Craft Stamper magazine, with an added bow and of course hat pins had to be included to fit the style and fashion of the time. Hats in older days were a must, no outfit was complete without an appropriate hat. I am of an age where I remember all of my female elders wore a hat for every occasion. Dream Valley Challenges Something Old, Something New. 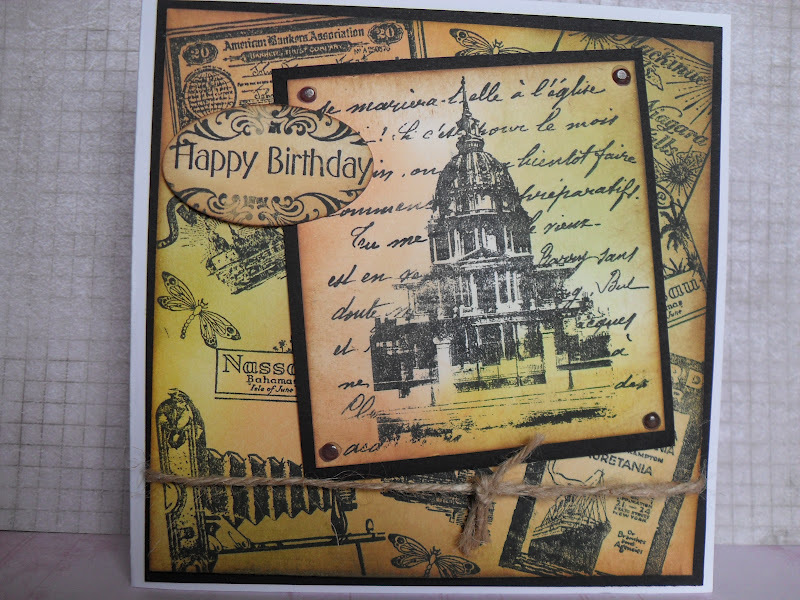 the Design Team were each sent a CD from Funky hand, mine is Happy, Happy Birthday, every CD has the built in function for making Word books, I was tempted to make one but thought I would stretch myself for I have never created work in a Work Station via a CD before. My final result isn't a masterpiece by any means but for a first attempt I am happy with it. 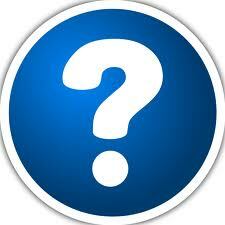 At Alphabet Challenge it is already round to the letter O - we would like to see One Colour Only Plus White. 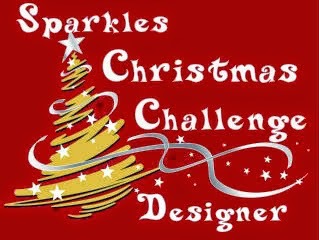 Please click on the link for the Challenge blog to see the few requirements for the challenge. The Design Team have made some interesting and varied cards to meet this challenge. This is my card. 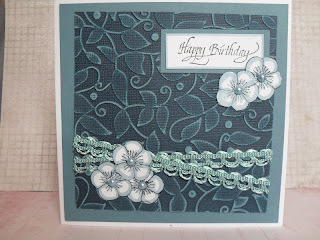 I embossed a piece of Core-dinations card, with a Christmas Vine Embossing Sheet. Sanded the surface to expose the core of the card. 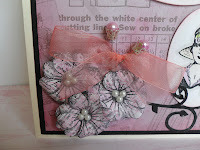 Added a few flowers, made from a fabulous small stamp from Dreamees, added a piece of ribbon and a greeting. Simple, quick and easy but I think effective. I hope you like it too.